Lawrence Hargrave was an Englishman who migrated to Australia in 1866. His experiments with kites were a by-product of his ambitions towards powered flight. He invented the box kite in 1893 and his kite experiments, using a curved airfoil for greater lift, were a major contribution to aerodynamics. 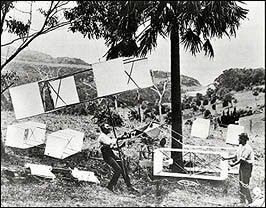 In order to further his experiments in powered flight, which were ultimately unsuccessful, he built a great variety of model airplanes and kites in the 1890s.